Unwind in the hot tub with wide open mountain views. Your laid-back week falls into the "lightly-scheduled" category, which means more time for the gym. Once you find a spot fireside, it may take some convincing to talk you into heading back outside. Which could be at the breakfast bar, dining table or closer to the fire. It's nice to know it's there, just in case. Pack your pockets with energy bars for later, and head for the Riverfront Express Gondola – a 12 minute walk. Warm and welcoming inside, absolutely breathtaking outside – now that's an ideal mountain getaway. You may as well stop at the heated outdoor pool. The kids'll keep asking until you say yes. Enjoy the spectacular, unobstructed views from the 7th floor hot tub. Pack a picnic and gather the hikers in your crew – Beaver Lake Trail in an easy 8 minute drive. Perfect your form on the Beaver Creek Golf Course, just a 7 minute drive from the resort. Make the Sheraton Mountain Vista Villa your home-sweet-home (or rather, lodge-sweet-lodge?) 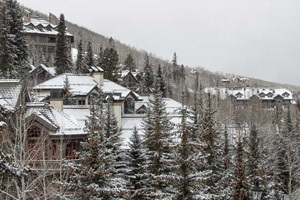 and enjoy the convenience of staying right at the base of Beaver Creek Mountain. The inviting alpine-meets-craftsman feel is warm and welcoming – case in point, the high-ceilinged lobby with cozy stone fireplace and cushy leather seating. After a day on the slopes, you’ll want to make a beeline for the outdoor heated hot tub on the seventh floor deck – but hurry – wait too long, and you’ll miss the spectacular, unobstructed views. (Postpone après ski until later. Make it “après soak.”) If you’re taking a day off from skiing, or you’re just feeling crazy-motivated, hit the 24/7 fitness center, then let the sauna and steam room work their magic on your mountain-weary muscles. Your one-bedroom Premium Villa has a good-sized balcony for hot drinks during ski season, and stargazing in the summer months. And the well appointed kitchen means your crew will be expecting more than bagels and yogurt for breakfast (just a heads up). Accept the challenge and go all out with french toast bakes, chocolate chip pancakes, omelets and whatever else they happen to “order.” You may want to do mornings in two shifts – one for the gung-ho, first-chair early birds, and a later breakfast and hat-and-glove hunt for those taking the day at a more leisurely pace. If you run out of steam before it’s time to make dinner, the onsite Marketplace and Deli has your back (open during ski season). During summer, the outdoor BBQ (plus your secret sauce) saves the day. If you’re traveling with friends vs kids, you may have to draw straws for the king-size Sheraton Signature Sleep Experience bed. That said, the sofa-bed winners get the cozy gas fireplace in the main living space. For a little off-mountain adventuring, check out the unique shops and restaurants in Victorian Edwards Village Center, an easy ten-minute drive. Summer brings a season full of outdoor performances at the Gerald R. Ford Amphitheater just 15 minutes away. Seats all sold out? Fear not, there’s room for 1,300 more on the hillside lawn. Events range from internationally renowned dancers and musicians, to free weekly concerts as part of the Hot Summer Nights series. Golfers in your crew? They can be warming up on the nearest course in less than five minutes. And nearby Jeep tours treat you to stunning views from 12,000 feet up. Downtown Vail, shop the farmers market, or sample the goods at local microbreweries. The dining scene is first-rate, and you’ll be ravenous after a day on the slopes or summer trails. Winter is perfect for snowmobile adventures, which leave from historic Camp Hale (originally built for military winter and mountain training during World War II). The Top of the Rockies tour is the most popular for spectacular views of four mountain ranges, including the Continental Divide. Door-to-door transportation, snowsuits, boots, helmets and even lunch (on the full-day tour) are all provided.